We are beginning to receive resources for our Pop-Up Maker Space. Today we got a few Makey Makey’s in. We handed the boxes to a few kids, and stepped back. Small teams of two or three students worked on unpacking and reading the directions. They fiddled, then forged ahead as they realized what the tool was capable of. They started by raiding everyone’s lunchbox for fruit. We hadn’t expected the kits to arrive today, but since they did we wanted to use them. But we hadn’t thought about needing fruit…so they “borrowed” everyone’s that they could find. One team tried some frozen celery they found in the freezer, but it didn’t work that well. Neither did the silver spoons they borrowed from the kitchen. Someone figured out you could draw on paper with a pencil and use the graphite surface. This led to the creation of neat dark pencil lines that you pressed on for the sound. Then they drew a piano keyboard. They neatened up the lines on the sheet of paper and had a good piano keyboard replica to touch for sound. By now almost everyone had become interested in what this was about. The group was a bit larger, contained several Maker Rings, but was inclusive and collaborative in a very comfortable way. Somehow they thought that maybe they could all work together to make sounds with the piano keyboard replica. Take a look at this video for a glimpse into that group process. Eventually they used the Makey Makey website to find more ideas. 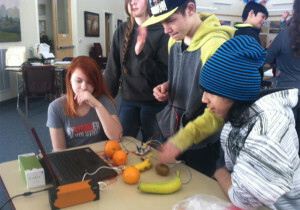 This led them to the MIT Scratch website where they found games they could control with the fruit. Then they looked up some old gameboy games. They printed out images of video game controllers, like the Game Boy Advance and old style Game Boy. Then they drew circuits with graphite pencil onto the paper controllers and played the games from paper. It was a great process of discovery and experimentation, as one idea led to another. The afternoon was a really good reminder of how open ended, organic, group processes can unfold in a natural and matter-of-fact way. Because Birch students have grown to be inclusive, tolerant, and kind, they were able to work together in respectful and productive ways. What is clear after participating in a busy afternoon like today is that there are many ways for kids to have fun while they are spending productive time learning in groups. 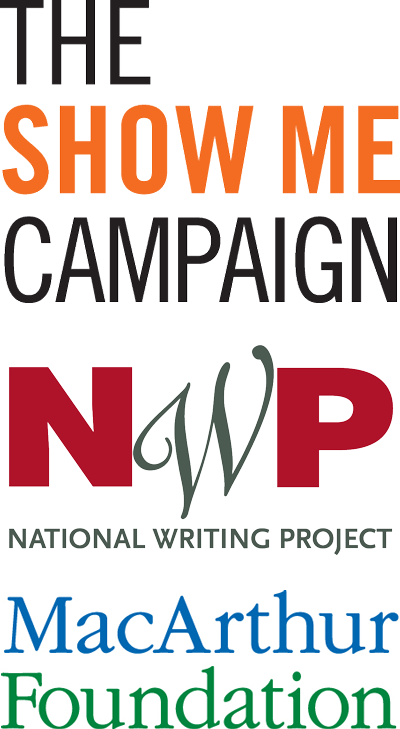 As we officially begin building our pop-up Maker Space students wanted to send a message of thanks and appreciation to The National Writing Project, John Legend and the supporters of the #LRNG Challenge Grants for supporting us in this project. THANK YOU! Vicki Davis interviews 5th grade teacher Kelly Wade Hines who has been using 3D printer in the classroom for PBL. new building tool. 13 minutes to 4 hours to print. – partnering with a HS class to use the 3D printer, and work with the elementary students as collaboration and mentoring. also available as kits to build 3D printers.